Concept: Office supplies and stationery specialist company. In April 2016, and following her participation in Seed Academy’s AccelerateHer Programme, Zandile Nzimande was so inspired to take her raw idea for a business from concept through to implementation that she was determined to prove that the pen is indeed mightier than the sword. Hence, in October of that year, she picked up her pen and laid down the sword of doubt and trepidation and began her journey as an entrepreneur with the establishment of Nkasi Amor Project, a company that specialises in providing corporates with top products and tools in stationery and general office supplies. ‘Just an idea’ becomes reality with the right tools. 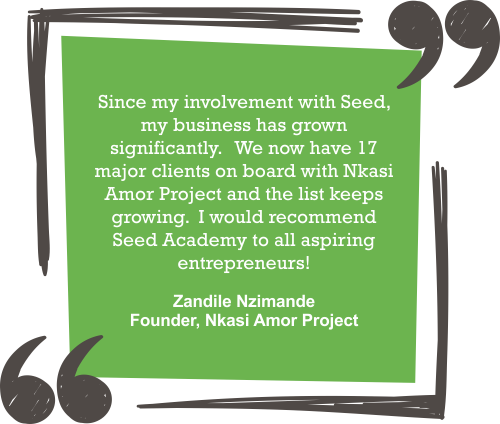 Says Zandile, ‘Before I came on board with Seed Academy, everything that I was dreaming about in terms of turning my business into a reality was ‘just an idea’. In the beginning, there was literally no pipeline. All I had was an idea that needed to materialise, and I had no means of knowing how I was going to make this happen. Zandile continues, ‘Through the coaching sessions I have had with my Seed Academy mentor, I have found real direction and to this day, she continues to guide me through ongoing coaching. Since my involvement with Seed, my business has grown significantly. We now have 17 major clients on board with Nkasi Amor Project and the list keeps growing.